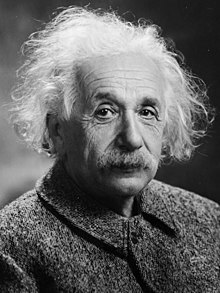 ↑ These include: About Zionism: Speeches and Lectures by Professor Albert Einstein (1930), "Why War?" (1933, co-authored by Sigmund Freud), The World As I See It (1934), Out of My Later Years (1950), and a book on science for the general reader, The Evolution of Physics (1938, co-authored by Leopold Infeld). ↑ ক খ Dudley Herschbach, "Einstein as a Student," Department of Chemistry and Chemical Biology, Harvard University, Cambridge, MA, USA, page 3, web: HarvardChem-Einstein-PDF ওয়েব্যাক মেশিনে আর্কাইভকৃত ২৬ ফেব্রুয়ারি ২০০৯ তারিখে: about Max Talmud visited on Thursdays for 6 years. ↑ This conclusion is from Einstein's correspondence with Marić. Lieserl is first mentioned in a letter from Einstein to Marić (who was abroad at the time of Lieserl's birth) dated February 4, 1902 (Collected papers Vol. 1, document 134). ↑ ক খ Peter Galison, "Einstein's Clocks: The Question of Time" Critical Inquiry 26, no. 2 (Winter 2000): 355–389. ↑ On the reception of relativity theory around the world, and the different controversies it encountered, see the articles in Thomas F. Glick, ed., The Comparative Reception of Relativity (Kluwer Academic Publishers, 1987), আইএসবিএন ৯০-২৭৭-২৪৯৮-৯. ↑ Levenson, Thomas. "Einstein's Big Idea." Public Broadcasting Service. 2005. Retrieved on February 25, 2006.